President Muhammadu Buhari on Saturday called for the cooperation of regional leaders in curbing the illegal flow of arms into the country. The President made this call while participating at the Extraordinary Session of the Conference of Heads of State and Government of the Community of Sahel-Saharan States (CEN-SAD) in Chad Republic. In a statement by the Senior Special Assistant to the President on Media and Publicity, Garba Shehu, Buhari regretted the illegal flow of small arms to Nigeria. According to him, the “very disturbing recent developments” have impelled the administration to seek support from a wider circle of countries if the illegal inflows are to be curtailed. 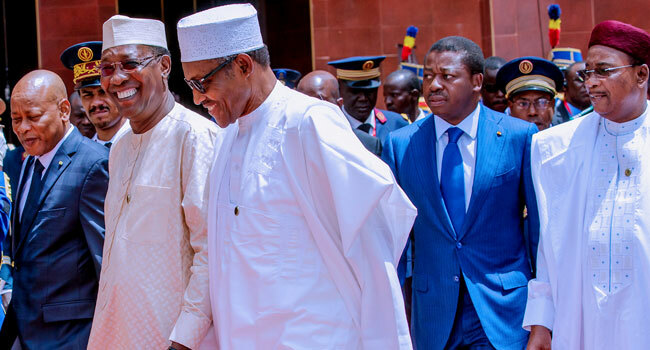 While in Chad, Buhari is expected to press for the protection of the well-being of the large population of Nigerians living both legally and illegally in Libya, which is the host country of the CEN-SAD Secretariat.